Finding yourself with no retirement funds later in life is not a fun situation. It doesn’t matter how you got there; it only matters where you go from here. If you are willing to put in the work, you can accomplish extraordinary things over a 10-year period. It is entirely up to you. Many people in dire financial situations are able to turn things around. Fortunately, it doesn’t take magic, but like losing weight, it does take discipline and commitment, and it won't happen overnight. You can go from broke to a financially comfortable retirement in 10 years. Read through the following steps, and apply them diligently and repeatedly, to create a retirement nest egg that will sustain you and maximize your savings. Day 1: Decide you are going to commit to this plan no matter what it takes. 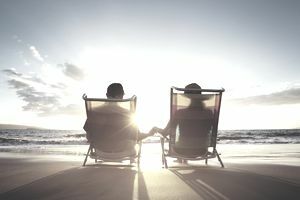 Your future is entirely up to you, and you can make the changes necessary to build up a nest egg and retire comfortably. It may take some drastic changes. Friends and family (even a spouse) may try to talk you out of the changes you’ll need to make, but don’t let them distract you from your goal. Imagine what it will be like to be financially secure, and make a commitment that you are going to keep taking baby steps until you get there. Write your commitment down, and read it each and every day to keep your motivation strong. Months 1 to 3: Begin a bare-bones lifestyle. You can shortcut your way to your financial goals, and while it's not easy, it’s certainly worth it. Your first priority is to cut expenses so that you have extra cash each and every week and month. If you employ every possible way you can think of to spend less it will powerfully accelerate your ability to save. This phase entails living on next-to-nothing while you get out of debt and build up savings. Rent a room instead of your own place, even if you are a couple. Take public transportation, shop at the Goodwill shop, and cook rice and beans at home. Skip the cable TV and expensive cell phone plan. If you are willing to live a bare-bones lifestyle for even a short while you’ll be able to watch your debt go down and your savings pile up. The way to get through it mentally is to remember that it’s not forever. Month 4: Develop a tracking system. Find a way to track your spending, month-end debts, account balances, and anything and everything related to your money. Tracking systems can be as simple as writing down month-end savings account balances and total withdrawals, or as complex as using budgeting software to categorize spending. Many people prefer a simple system and find it's easier to keep up. The key is finding a way to organize your finances that works for you so you will stick with it. When you track your spending, you can see patterns over time and spot problems quickly. It is also a powerful motivator to be able to look back and see the progress you have made. Months 5 to 12: Save all your extra money. Now that you’re spending less, start putting money away in a savings account or other safe investment. Don’t worry about investing it. That's for later down the road. Right now you need to get comfortable having and keeping money in the bank. Challenge yourself to accumulate more and more. Each time you go to make a purchase, picture how much your savings account balance can continue to grow if you skip the purchase. Remind yourself of the commitment you made and that you want financial security as quickly as you can achieve it. Money is out there to be made, and you may have money-wasting habits that could be turned into money-making habits. Even if it involves picking up aluminum cans for recycling at five cents each—there is always something you could be doing with your spare time to make money. An added bonus comes from working more; it gives you less time to spend money. Find a way to eliminate a few hours of dilly-dallying from your week and replace that time with a way to earn part-time income or a way to learn new skills to increase your future earning potential. Can you get better at your trade, change jobs, learn a new skill, or improve your sales abilities? Talk to people who make more to find out what it takes. Go to night school if you need to, or take online classes. Don’t forget about the importance of social skills. Maybe you have the right technical skills but your people skills need work. Ask your friends, co-workers, and boss for honest feedback. This is the time to put your ego aside and make the changes necessary to get ahead. Go to the library and find one money-related book to read each month. It might be about making more money or about investing. It could be about building wealth through real estate, or perhaps about how to improve your skills in your career. You may not understand everything you read at first, but that’s ok. If you stick with it, you will absorb the knowledge. As you start to make more, it is far too easy to begin to spend more and more until you spend yourself back to broke. Avoid this by continuously monitoring your financial situation according to the tracking system you set up in year one. It is also powerful to continue to read your commitment to yourself that you wrote down. Don't' forget that you are doing this for you, and you’re worth it. If you’ve followed the steps above, by the time you get to year five you are well on your way to financial security. That doesn’t mean you want to get lazy with your financial discipline. You won’t get fit or stay in shape by exercising a few times a year. You have to do it regularly, and this applies to your money habits as well. Financial success is about building habits that you stick with for a lifetime. At this point, you’ve had a few years to build good habits, and it is time to figure out how much you need to retire. Then you can update your financial goals and apply the steps above toward continuing to fund your retirement goal.